How does Smart House work? You have been probably looking for information in the Internet on demand “lightning Kiev, grounding Kiev region, etc.”, before you get to this page of our website. 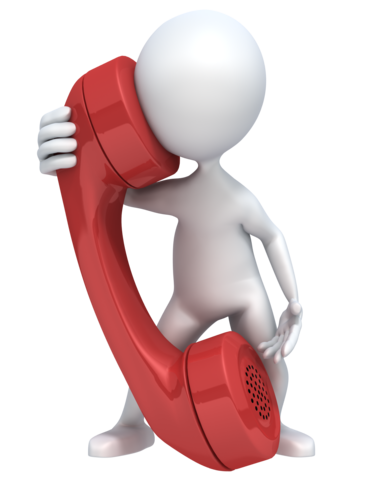 We are pleased that as a result of searching you choose our company. Because this is one of the main directions of our work. Our specialists regularly train the operation of equipment and upgrade their skills, participate in technical seminars of the design and installation of lightning protection and grounding, which is confirmed by certificates of well-known companies of the equipment supply. Region of works and supply of materials in our company: Kyiv region and whole territory of Ukraine. Our company offers a full range of services for the creation systems of lightning protection, grounding both in Kiev and in other regions of Ukraine – from the inspection, selection and making of project, delivery of materials and components, to assembly all defense system and its commissioning. All our experts have special education, necessary knowledge and skills for this job. We always have all the necessary materials and components of the lightning protection and grounding system in our warehouse. We use the equipment only from reliable European manufacturers. We offer the best prices on the market of such services. We work with individuals and legal entities on cash and bank transfer. Only here you can order installation and after-sales service system to get “lightning protection and grounding” at the highest level. Installation of equipment for lightning protection, grounding is made according to the current Ukrainian standards and technical regulations. Therefore, working with our experts, you will get the quality, reliability, durability and safety of the lightning and safety of your home. Why are we using the lightning protection system and grounding? One of the most dangerous and unforeseen natural phenomenon is a lightning. It only leads to harmful effects: fire, damage to the roof, a violation of load-bearing structures at home, defeated people shock, failure of appliances and electronics in the electrical circuit, the destruction of all electricity system at home, etc. 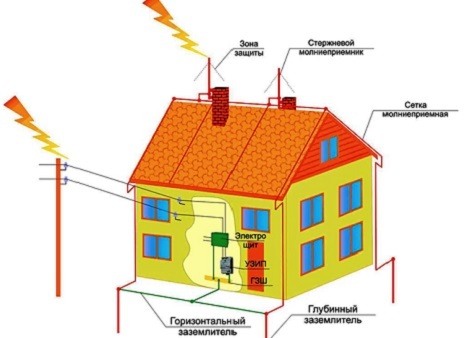 Dangerous overvoltage in the electric system of the home can arise not only through direct contact with the object of lightning, but also in distant places (2 km. ).Being inside unprotected from lightning house people can become victims of the current touch to the usual metal objects and surfaces. To protect yourself, your family and property, you need to take care about that the lightning protection has to be on guard of your home. Types of lightning protection systems. There are a many types of lightning protection systems in Kiev, which are designed for different types of threats from lightning. 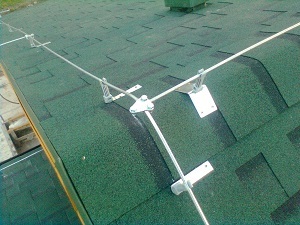 External safety system prevents a direct lightning strike to the building. The internal system is designed to protect the circuit in the house from anomalous overload caused by lightning and protect people and equipment from electric shock inside the building. External lightning protection consists of three main elements: lightning arrester, lightning conductor and the ground loop. The operating principle of the protection system is to ensure that the lightning arrester assumes the lightning discharge, the collector dissipates the current (capacity of such a discharge can range from 1 to 200 thousand amperes) to grounding rod. Circuit of grounding recessed in the soil, provides current spreading into the ground. External lightning protection can be active and passive. 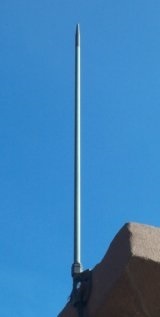 In the passive system as the lightning arrester used usual metal, pin stretched rope, or metal mesh, which may be located at the highest point of the building. In the active lightning protection system are used special devices (active lightning arresters), and its principle of operation is based on the occurrence of early streamer emission counter at approaching thunderstorm. Active lightning arrester has a greater range than passive, which allows you to protect not only from lightning strike in the building but also the surrounding area. Special equipment for systems “lightning protection and grounding” can be made of galvanized or stainless steel, aluminum and copper. All the elements of the defense system must be protected from corrosion, so choosing them you need to consider on from which material it is made of. For example, copper parts is not recommended to combine with galvanized or aluminum. But stainless steel is combined with copper, and aluminum. At the heart of the internal lightning protection is the principle of gradual reduction in the power surge to a safe level. For this the whole building installation conditionally divided into zones, which are installed surge arresters. It may be high-pass filters, diode, gas discharge tubes or elements; each of them has a particular use, advantages and disadvantages. Therefore, their using should be carried out professional calculations and measurements inside the house. To prevent dangerous potential differences, all metal constructions in the house, and all communications (gas, water, electricity, telecommunications), should be communicated with each other using alignment tires connected to the grounding device. Why do you need the grounding? Grounding is an integral part of the lightning protection system and it provides a secure spreading of the dangerous current into the ground. Grounding device can be either a single electrode (conductor) or the entire steel construction (vertical electrodes 2-3, 2-3 meters long, connected by a horizontal electrode), which is dug into the ground at a certain depth. 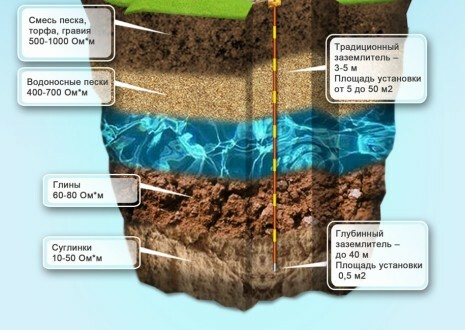 During the grounding installation, there are many subtleties and nuances (the quality of the material, length of the conductor, the method of its placement, soil resistivity at the installation site, etc. ), which effect on the final cost of the work. Call us if you decide to protect your home using systems of lightning protection and grounding in the Kiev region or in other regions of Ukraine. We will find for you the best option, taking into account the features of the object and your financial capabilities. SYSTEM OF ELECTRICIAL PROTECTION © 2007-2017 All rights are protected.